Various studies on agro-environmental science have been conducted in order to cope with environmental changes including climate change. For example, we make efforts to estimate fluctuation of food production, to evaluate impacts of crop and ecosystem due to high CO2 and high temperature, to improve cultivation technology against abnormal climate condition, to develop methods for calculating and mitigating greenhouse gas emissions, and to evaluate impact on biodiversity and ecosystem service. In a bid to provide the public with the results obtained from these studies, it is necessary to disseminate information in line with the rapid progress of information and communication technology (ICT) in recent years. Use of already accumulated information and technology to acquire and manage large amounts of information are specific examples of studies that we are currently working on. Moreover, basic research on environmental information is required so as to promote the utilization of the study findings. As part of the research, we integrate each information, and then utilize it for evaluating as well as deliver the results rapidly. 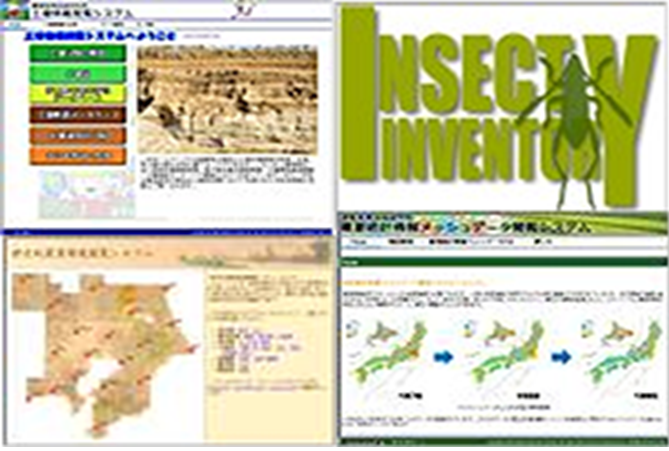 In Division of Informatics and Inventory, 25 researchers constitute five units, Soil Inventory Unit, Insect Systematics Unit, Remote Sensing and GIS Analysis Unit, Statistical Modeling Unit, and Integrated Assessment Unit, conducting research to promote the use of environmental information. Based on the information obtained by the soil survey and the long-term monitoring of radioactive substances, Soil Inventory Unit conducts the study on the accumulation, classification and dissemination of the soil information which becomes the basis of agricultural production. Insect Systematics Unit studies the identification and classification of insects by utilizing around 1.35 million specimens deposited in the insect museum of our institute. Utilization of the information associated with the specimens is also included the studies. Remote Sensing and GIS Analysis Unit conducts research using remote sensing information and maps of artificial satellite, aircraft, drone etc. Statistical Modeling Unit focuses on studying the description and prediction of various phenomena found in agricultural environment based on statistical data analysis method and mathematical modeling techniques. Major research subjects of Integrated Assessment Unit are (1) Development of assessment method for integrated influence of agricultural activities, and (2) Advanced usage and disseminating of agro-environmental information, using various information concerning agriculture. Our division aims to make the information more easily accessible, to support decision making based on scientific evidence, and to build an environmental information infrastructure through our research in order to tackle the issues faced by us.